We perform thorough inspections at reasonable prices. The inspection reports have pictures and some videos for easy understanding your property situation. This helps clients get to know the condition of the property they are about to buy or sell, as well as give them the confidence they need to make an informed decision. We are located in St. Petersburg, FL and serve all surrounding areas. Where the realtors go, we go! I have inspected numerous homes for agents in this area. Ask for references and give me a try! I also work when you are ready — that includes Sundays! 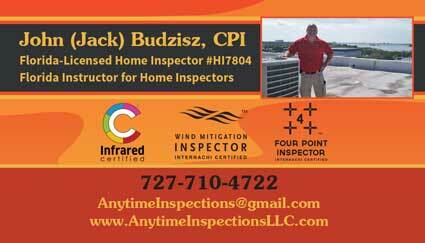 John Budzisz is the owner and operator of Anytime Inspections. 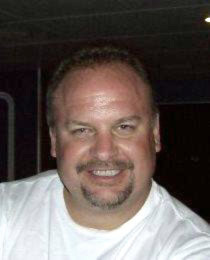 John utilizes his 25 years of building industry experience along with his national license, State of Florida license, and InterNACHI certifications in inspecting properties. John’s knowledge of the manufacturing and proper installation of a variety of building products will ensure your questions are answered to the fullest extent possible so that you have a complete understanding of all components and systems on your property. As an instructor at Ed Klopfer School of Real Estate for Home Inspectors in Sarasota, Florida, John stays abreast of current trends in home inspection regulations and techniques while teaching new home inspectors.